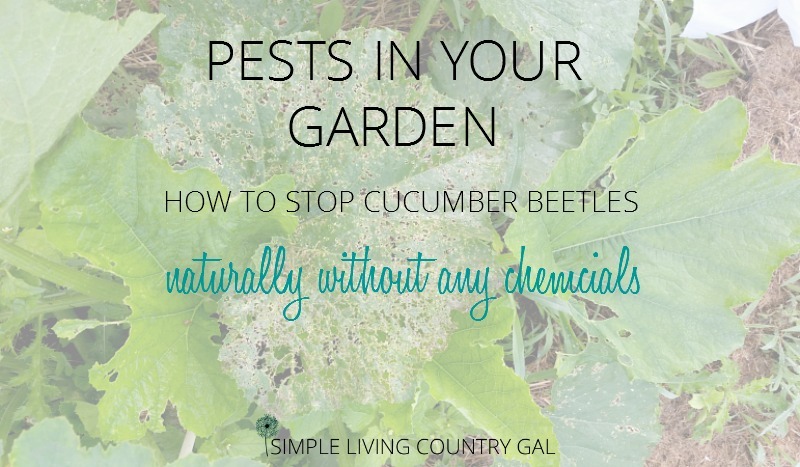 If you are trying to stop pests organically then this post will help you learn how to stop cucumber beetles in your garden. Oh, the art of gardening. In the spring you have these grand plans. You will plant this amazing garden, full of beautiful veggies as far as the eye can see. Butterflies and honeybees will travel far and wide just to visit your garden and all of its splendor. You plant your seeds, weed your rows, taking care to keep things neat and tidy. You go about your gardening life not hurting anyone or asking for any trouble at all. One day you head out into your wonderful garden and you notice something isn’t right. You have some leaves that look, well, off. More than off, they have been eaten. Your stomach drops and you go into panic mode. A little dramatic? Not even close. When you have a garden you work hard to make sure your plants grow healthy. So when anything happens. Anything at all. You go into panic mode. I went out one morning to weed my garden and I knew before I had even got there I had a problem. Leaves from my vine plants had been destroyed. And not just a couple…quite a few. They looked just awful. Something truly sinister must have done this. Something big, something awful, something evil. I did some poking around and I found what was responsible. Tiny yes but able to multiply if left unnoticed and able to do some considerable damage if there are enough of them. And in my garden…there were plenty. 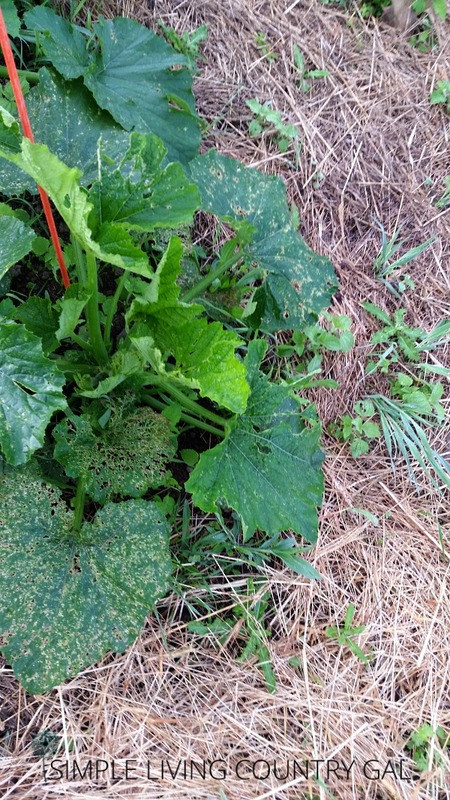 So what do you do when you find out you have an infestation of cucumber beetles? Well, chemically not much at least not at this point. But since I am an organic gardener that wasn’t much of an option anyhow. Luckily there are things you can do to cut back on the population and damage to your plants. First and foremost, you need to know what you are dealing with. There are quite a few little pests out there, so actually finding the culprit will help quite a bit when you are fighting it. This is, after all, a battle so you need to know your enemy. Cucumber Beetles can be spotted or striped and have a yellowish or greenish look to them. They are small and usually where you find one you find more. They show up in the spring and feast on leaves of most plants. My garden vine plants tend to attract most of them. Pumpkins, zucchini, watermelon and of course, cucumbers were the biggest draw. 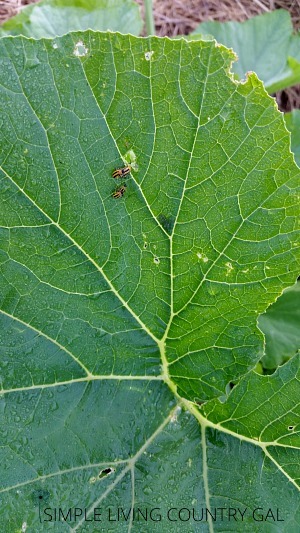 The best tip to stop cucumber beetles organically! Your best bet with cucumber beetles is to physically remove them by hand. The best way to do this is to place a piece of cardboard under your plants to catch any that fall as you are picking the little beasts. If your garden is close enough you can also vacuum them up but mine is just too far for that. I would love to try the vacuum technique, how cathartic would that be?! Hand picking works pretty well though. In the early stages, they are not very fast moving so you have time to catch and destroy the little pests before they make their escape. 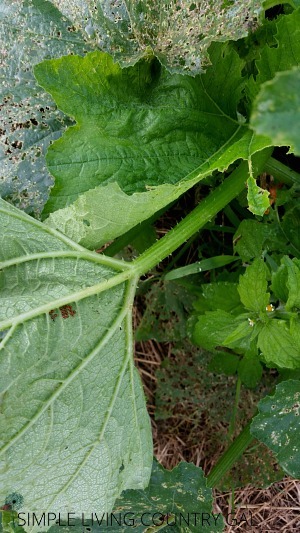 Look for cucumber beetle eggs. This is by far the most important part so don’t skip it. These beetles lay a ton of eggs and you need to remove as many clusters as you can find. Eggs are much easier to find than you may think. The cucumber beetle will mainly lay them on the underside of your leaves but if you have a full invasion they will lay them on top of the leaves as well. The eggs are in small clusters and look red or brown. They are tiny, yes, but once you see a patch they will be much easier to spot. Remove all the egg clusters. The easiest way to remove the eggs is to simply cut out each cluster of eggs. You can tear them out, but I find that using scissors reduces the damage to the plants. Just cut out each cluster of eggs and put them in a bucket. Make sure you dump your bucket very VERY far away from your garden. And NOT in your compost pile. The trick here is to remove the eggs permanently so dumping things close will only increase your chance that the beetles return. Repeat the egg search daily. Since the cucumber beetle eggs are tiny, the chances that you will get them all the first time are slim to none. Just add cucumber beetle hunting to your daily garden activities and keep things from getting out of control. I have friends that have used floating row covers with much success. A floating row cover is a lightweight material that you actually lay over your plants like this one. The good news is, the material is porous so your plants will still get plenty of sun and rain while keeping any pests off. The bad news is the cover also will keep the good guys off as well. To fix this, you will need to remove the cover for a bit each day to allow bees to pollinate your plants. I have found covers are too much work in my large garden so I do not use them. In smaller gardens or in families where their kids are not terrified of any physical labor, covers may be a viable option. Another tip to remember is to ensure your soil is healthy at all times. This will decrease the likelihood of pests invading in the first place. You can read more about garden soil here. You can also get yourself a supply of good bugs to go after the bad. I have not tried this tactic yet, but have always been intrigued by it. Getting the good bugs is easier than you may think. If an online company sells seeds, chances are they sell bugs too. Ladybugs, green lacewing and the spined soldier bug, will feed on pest eggs keeping things under control. Try it to see if you like it. These are not the only options out there for organic pest control. Do your research and give a few of the organic alternatives a try. Let me know what has worked for you where you live! kaolin clay, beneficial nematodes, are just a couple of options to try out. Remember growing our own gardens is a huge part of natural living. Just because you have a pest problem does not mean you need to reach for chemicals for help. Do your research and practice prevention whenever possible. More often than not there are simple and surprisingly effective ways to remove the problem without resorting to harmful chemicals to do the job. Think differently, try new techniques, especially when learning how to get rid of cucumber beetles, and keep a journal so each year as your garden grows so do you.